Martin Růžička: European Player of the Month for October. At the first international break, the Czech Extraliga's leading scorer is not Kladno's Jaromír Jágr or Tomáš Plekanec, despite the fine and high-profile tour they've made around the country, filing arenas everywhere they go, nor is it any of the many other locked NHLers who have flocked to the league. It is Oceláři Třineč's Martin Růžička, who has 36 points in 19 games and racked up an amazing total of 20 points in 10 games in the month of October. He did so in relative obscurity, tucked away in a small industrial town on the Polish border. 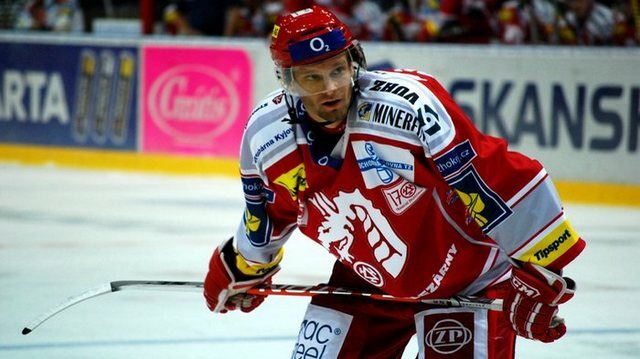 Far away, in the capital city of Prague, mention hockey and the name Růžička nearly everybody will think of Vladimír, former star player and now coach of Slavia. Even the name Martin Růžička might lead to some confusion, as the starting goaltender in Pardubice has the exact same name. Yet the career that Martin Růžička the forward has made for himself since arriving in Třinec as a 24-year-old in 2009 is impressive. To that point, he had bounced between four different clubs in the Extraliga and I.liga, never recording more than 18 points in a season and failing to distinguish himself as top-line player. However, in the 2009-10 season, he recorded 47 points in 50 games, which was enough to earn him a spot on that year's gold-medal winning Czech team at the World Championship. He followed that up with 50 more points the next year, but he that was just a precursor to the playoff he would have. There, he shattered the league playoff scoring record, recording 33 points in 18 games, leading Oceláři to their first, and so far only, national championship. After a year with Amur Khabarovsk of the KHL, he's back in Třinec this season, and what a season it's been so far. He has failed to register a point in only two of the 19 games he has played. His most dominant performance came October 5, when he was in on all 5 of the game's goals in his team's 5-0 shutout victory over visiting Česke Budějovice, thanks to a hat trick and 2 assists. He finished his amazing month with a 4-point effort against local rival Vítkovice on October 28. Apparently, a month like that will get you attention no matter where you play -- not only national but all across Europe. Eurohockey.com readers voted him Europe's best hockey player for the month of October. Not only was he competing against Jágr and Plekanec for that honour, but other names like Henrik Zetterberg, Alexander Radulov, Ilya Kovalchuk and Alexander Ovechkin. Unfortunately, European hockey fans won't get the chance to see him in action this week at the Karjala Cup -- he's being kept out with back trouble. However, it seems to be only precautionary, and he's expected to be back in the lineup when Třinec returns to the ice next week. When Europe's top four hockey nations released their roster last week for the Karjala Cup, the first leg of this year's Euro Hockey Tour, there was a lot of head-scratching among observers. With the surplus of bona fide talent playing in Europe right now, some were anticipating an all-star tournament of sorts in Finland that might include the likes of Jaromíř Jágr, Alexander Ovechkin, Henrik Zetterberg and others. But while some locked out NHLers were chosen to represent Finland, Russia, Sweden and the Czech Republic, the teams have mostly been made up of players committed to Europe for the full season. The announcement of a roster without Jágr, David Krejči, Aleš Hemský and Tomáš Vokoun was especially disappointing to hockey fans in Liberec, who were hoping to see an all-star cast assemble this Thursday when the Czech Republic hosts Sweden to open the tournament. In fact, the Czech Republic could have built an entire team based completely on NHLers now playing in the Czech Extraliga and KHL. "Of course, if Jarda Jágr plays, the fans will come," said Czech national team coach Alois Hadamczik. "But for me it can be rather annoying; if the NHL starts, we're going to the World Championships with only players in Europe." Indeed, he's probably right. Of course, everyone remembers the last NHL lockout, the one that wiped out the entire 2004-05 season and left virtually all players free to compete in that year's World Championship. The Czech Republic, with an all-star cast that included Jágr and Vokoun, won the gold medal with a 3-0 victory over Canada in the final. However, fewer people remember the tournament in 1995. That year, when a lockout forced the NHL to begin a 48-game schedule in mid January that finished in early May, no NHL players were free to compete in the World Championship. That year, the Czech Republic, with a roster composed entirely of Extraliga players, finished 4th, losing the bronze medal game to a Canadian team composed of players from the AHL, IHL and European leagues. If the scenario of 1995 repeats itself, which seems like a very good possibility at this point, Hadamczik has to create a team of players in Europe, and he wants to get potential players ready to play during the Euro Hockey Tour. Balancing the possibilities between NHLers and domestics, his roster for the Karjala Cup includes both: Ondrej Pavelec, Marek Židlický, Ladislav Šmíd, Tomáš Plekanec, and Jiří Tlustý will be there (although Židlický and Plekanec will only play in Liberec), but so will young charges Jakub Krejčík, Jakub Svoboda and Tomáš Hertl. Under normal circumstances, Hertl would probably be at the U20 tournament, which will run concurrently in Sweden in preparation for this year's World Junior Championship, but since an all-European-based Czech team at the Worlds would almost certainly include Hertl, it's important to get him playing time with the big boys. Even with a few big names missing, there are still plenty of players to follow at the Karjala Cup, however. Most games will be televised in the Czech Replublic on ČT Sport and live text coverage will be available in English at Eurolivescores.com. From hokej.cz, below is the Czech roster, their lineup for the first game against Sweden (Wednesday at 18:00 CET) and the tournament schedule. Ondřej Pavelec (Bílí Tygři Liberec), Alexandr Salák (Färjestad, Sweden). Marek Židlický (Rytíři Kladno), Ladislav Šmíd (Bílí Tygři Liberec), Petr Čáslava (Cherepovets, KHL), Jakub Nakládal (Spartak Moscow, KHL), Filip Novák (Dynamo Moscow, KHL), Jakub Kindl (HC ČSOB Pojišťovna Pardubice), Jakub Krejčík (HC Lev Praha, KHL), Lukáš Galvas (HC Oceláři Třinec). Tomáš Plekanec, Jiří Tlustý (both Rytíři Kladno), Petr Nedvěd (Bílí Tygři Liberec), Jiří Novotný (HC Lev Praha, KHL), Zbyněk Irgl (Dynamo Minsk, KHL), Michal Vondrka (Slovan Bratislava, KHL), Jakub Petružálek (Khabarovsk, KHL), Petr Koukal (Nizhnekamsk, KHL), Petr Hubáček (Jyväskylä, Finland), Jan Kovář (HC Škoda Plzeň), Jakub Svoboda (HC Kometa Brno), Tomáš Hertl (HC Slavia Praha), Lukáš Pech (HC Energie Karlovy Vary). Salák (Pavelec) - Židlický, Šmíd, Novák, Čáslava, Kindl, Nakládal, Krejčík, Galvas - Nedvěd, Plekanec, Tlustý - Petružálek, Koukal, Vondrka - Irgl, Novotný, Hubáček - Hertl, Kovář, Svoboda (Pech). For the past six weeks, hockey-starved NHL fans have had to depend largely on hockey from Europe to get their fix. While a few games have been on in the United States and the United Kingdom on various ESPN platforms, most have had to search for internet streams with foreign-language broadcasts. These fans should be glad to know that live text commentary will now be available for many games in the Czech Extraliga and KHL. lead Kladno against Brno Tuesday. Josef Poláček, hc-kladno.cz. All Czech hockey fans are familiar with the site onlajny.cz, which provides online text coverage of every Czech Extraliga game, as well as in lower men's leagues and top junior leagues. In the past couple of years they have also periodically provided English commentary to international events in the Czech Republic, such last last season's U18 World Championship in Brno, Znojmo and Břeclav. In the past year and a half, I have covered several international events for the site's English version, called eurolivescores.com. Highlights include the 2011 IIHF Inline championship game in Pardubice and the 2012 U18 Women's championship game in Zlín. Typing events from a hockey game as they happen in rapid succession in a coherent manner takes some getting used to, and at first was a bit stressful, but I've gotten used to it. Tonight, I will cover a professional hockey game in this manner for the first time: Rytíři Kladno vs Kometa Brno. For the third time this season, Kladno will play a home game at O2 Arena in Prague, the largest venue for hockey in the country. Both previous games drew over 15,000 fans and even more are expected this time. The increased interest in watching Kladno play is, of course, due to the NHL lockout and the subsequent arrival of club owner Jaromír Jágr and several other superstars to the team. In what will surely be a disappointment to all those who have bought tickets, Jágr will not be in the Kladno lineup tonight, sitting out his second straight game with a yet-to-be-specified lower-body injury (though he says it's not the groin, which has given him trouble in the past). However, familiar names such as Marek Židlický, Tomáš Kaberle, Jan Hlaváč and Tomáš Plekanec will be. For Kometa, non-Czechs might know the names Miloslav Hořava and Róbert Petrovický, who both played in the NHL. The game is important for the league standings, as Brno is in 2nd place with 27 points, one ahead of Kladno. each other in KHL action on Thursday. Tuesday's game is actually the second that Eurolivecores has done in the Extraliga; on Sunday, Bill Meltzer of hockeybuzz.com provided commentary for Liberec-Kladno. Coming up on Thursday, I return to O2 Arena to begin KHL online coverage as Lev Praha hosts CSKA Moscow, a matchup that will feature Zdeno Chára against Pavel Datsyuk. It will be a rematch of last Thursday's meeting in Moscow, where Datsyuk's CSKA club triumped 3-0. As some readers might know, I write for Lev's English website, so I'll try my best not to be a homer. In addition to all Lev home games that I'll be on location for, myself and a team of other commentators will provide commentary of other select KHL games, either from the arena or remotely. Tuesday's Kladno-Brno matchup begins at 18:15 CET, 12:15 ET. Thursday's Lev-CSKA battle begins at 19:00 CET, 1pm ET.